SBI existing customers can open PPF (Public Provident Fund) Account online through Internet Banking. Here we will show you how to open PPF account online in SBI. If you have a Saving Account already in SBI, you can open your PPF Account through Internet Banking. Once your PPF account is opened, you can directly deposit money from your savings account to PPF account through net banking. If you opened PPF account in same branch where your saving account exist then it (PPF) will be linked automatically with your saving account. If your branch is different then you can submit a request to link ppf account with your saving account. Ok so let’s see how to open Public provident fund account online in SBI. 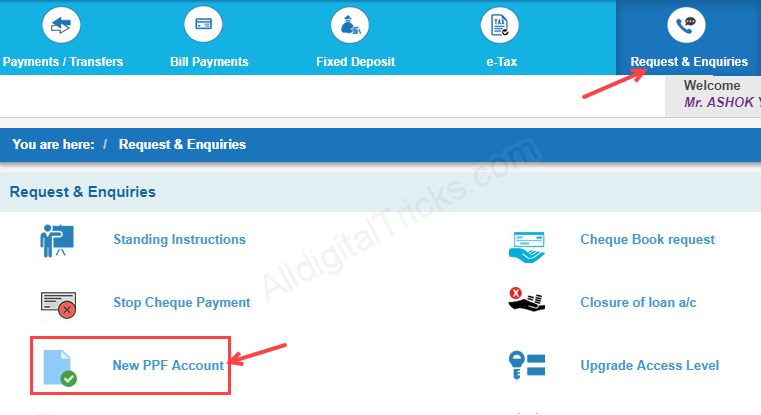 1: First, you have to login to SBI net banking account. 2: After logging in, you have to click on the Request / Enquiries tab. In the Request / Enquiries, you have to click on New PPF Account. 3: On the next screen you can see your name, address, CIF number and PAN details. Type your 5-digit branch code in the branch code and click on Get Branch Name. You can now see your branch name. Check your details are correct then click on Submit. That’s it you have applied for PPF Account successfully. 5: Now you have to click on Print PPF Online Application. Here you can see your application reference number, click on that and download your PPF account Application. You need to take print out of this Application and need to fill-up some details and attach passport size photo. Now visit your selected branch and submit your Application with ID proof (Aadhaar card, PAN card, Driving licence, Voter Card) and Address proof (Aadhaar card, Driving licence, light bill). Once your PPF account is opened, it will linked with your saving account and you can access it online through net banking. You can deposit money in PPF account online from saving account, no need to visit branch. So this is how existing SBI customers can open PPF (public Provident Fund) online in SBI through net banking. 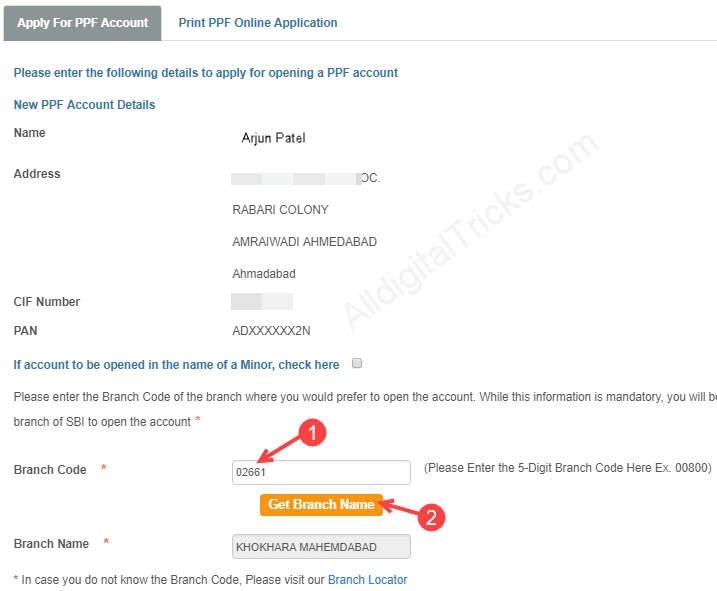 If you are a new customer then you need to fill-up separate PPF account opening form and submit it to branch.